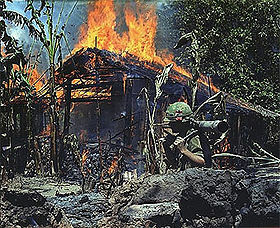 The bombing of a Viet Cong base camp? Nope, Photoshop, 5 minutes. Ahh yes, the "Vietnam War". The "War" that cost many people their lives. 58,209 US citizens dead. Those poor wives losing their husbands, those daughters losing their fathers and brothers. Damn, isn't that just a kick in the teeth? Well, not really, if you let them go to "War", then you should have some doubt as to whether you are going to see them again. I mean seriously, if your son is going to a War, do you really expect him to come back? Oh, and the "Vietnam War" didn't happen anyway. What? You don't believe me? Well I've got evidence. The alleged outcome of the war was US defeat... I can't see it happening myself. I mean look, when have the US ever lost before? Never. Why, when against a country that has half as many poorly trained and equipped troops, do you lose? That's because it didn't happen. This was all a result of Communist propaganda, issued to show the supporting countries how they had defeated the United States of America. This was known as the Vietnam War Hoax. As you can see, Diem's eyes are not focused on Eisenhower. Why? Photoshopped. You do not lead by hitting people over the head — that's assault, not leadership. Unless you are a Communist, I suppose. - Eisenhower, September 1960. So, here's the story. It all started in the late 1800s: the French used to own part of Asia, of course the other countries that were currently residing in that area got a bit nettled. Even after asking politely many times. Of course, everyone knew Communism was in, and Fascism was out. Turning to a small country that is located on the top of Asia, Russia, they asked for help. Of course, Russia gave them what they wanted, and started a war with the US. So, that's a reason to start a war? France wouldn't give you your piece of land back, so you are going to go in there and declare war on its ally? 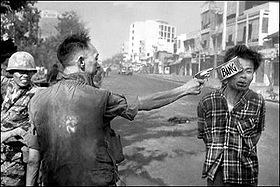 When it was finally realized that they weren't getting their land back, the Communist Democratic Republic of Vietnam decided to issue fliers saying that they had defeated the USA and her allies, including France. The President of Vietnam, Ngo Dinh Diem started boasting about this victory and was gloating about it at a meeting with President Eisenhower. Eisenhower finally ended the meeting by head butting Ngo, and thus started the little scuffle. So boasting about something that never happened... gets you in to trouble? Well, no not really because it didn't happen. This was all a fabricated event in history, much like the moon landing. It was carried out very successfully, and efficiently by a group called Operation Rolling Thunder. Operation Rolling Thunder. The code name for the group that set this whole hoax up. The membership was made up of trained professionals. Yes, 5 teenagers from New York, equipped with Photoshop, some web space, a video camera, and a student from England with an A in English Language. They created a website that showed pictures and videos of this "War", and posted news articles reporting on it. To create a good atmosphere of what was happening, they would act out and film each news report. Because there were only 5 members of the group, sometimes (especially in battle scenes) they would have to play many characters. They said that sometimes it took as long as 5 minutes to put these reports together, and they still had time to live normal lives. So why did they go to extreme lengths to pull off this fake War? Well it could have been the fact that they were bored during the summer and it just got out of hand, or that they managed to make some kind of gain out of it. However, it could be none of the above and just the fact that they wanted to score some points for Russia during the Cold War. Either way, the War didn't happen. The group were found out April 30, 1975, due to an Englishman walking the street getting back from shopping. He found the 200m2 area that they were using to film the battles. He said that he heard "Gunshots, screaming, death and fire. The fire came from the sky and rained down all over the area. I don't know how no-one had noticed the area before." This is probably an exaggeration: even in the reports there was not that much coming from the sky, and it was reported that there was only an increase of 400% CO2 concentration in this area. This was 16 years of successful War hoaxing. However, the US Government censored this new discovery because of the small chance they would have looked stupid for not realising that none of their soldiers had been going to the War. After this, they too started reporting on the event and this resulted in the War being entered into their history books. In conclusion, the War didn't happen, it is all a fabricated event in history. If you still don't believe it, please re-read the report without getting bored half way through. The 5 operatives were taken to court, pressed with war crime charges. They were found guilty and were imprisoned. ↑ "Look mate, if you don't give me that land back, I will bomb you into next week." ↑ No it's not, and a war did not start. ↑ Face it, most of you believe in the Vietnam War, amateurs. ↑ This is the only photo that was published by the US government. ↑ Goes to show what you can do with a Mac. ↑ The CO2 concentration in 2006 is 375%.